For many years Spain stands among the prestigious countries as one of the tourism business leaders with affordable services. One of the most attractive coasts of the country is Costa del Sol, where many resorts are popular among tourists and investors. One of the most interesting - the city of Benalmadena. It is a picturesque place in the province of Malaga. The nearest airport is located in the eponymous provincial capital - the city of Malaga. Trains depart every 20 minutes and the travel time is about 40 minutes. Real estate in Benalmadena - a decent offer in Spain. The city is also suitable for active young people and families with children. The city has three major areas. The coastal tourist part is called Benalmadena Costa, on the hill is located the entertainment and business part - Arroyro de la Miel, and the residential non-touristic part of the hillside - a quiet village Benalmadena Pueblo. The beach area of the resort stretches for 8 kilometers, awarded the "Blue Flag" for grooming and environmental cleanliness. The oldest preserved buildings in the resort – the Two Almenara towers of the 15th century. There are many interesting architectural monuments of the later period, including the Santo Domingo Church of the 17th century and the Colomares Castle of the late 20th century, built in honor of Columbus. On the seafront you will see the magnificent Bil-Bil Castle, built in a Moorish style. The local delicious cuisine, the wine, lush tropical gardens and fountains perfectly complement the picture. The city has pretty big selection of properties. In the center are mainly concentrated small one or two bed studios. But there are also full-fledged two-bedroom or three-bedroom apartments for a stay with children. Apartments in an enclosed residential complexes with swimming pools, a parking and even gardens - the most popular type of housing in the city. For more affluent shoppers are on sale detached houses and villas with private garden and a swimming pool. 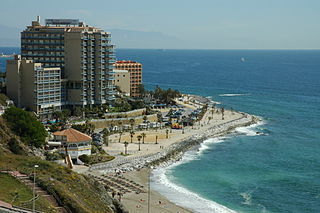 Benalmadena is not the cheapest resort in Spain, but also it cannot be called an expensive. The average cost of a standard studio is around 50 thousand euros, one bedroom apartment - 90 thousand, and the villa - 500 thousand.